Once in awhile I love making desserts. I have a huge sweet tooth and always like to have something sweet after dinner. So the one night I decided I wanted something different for dessert. I had an idea, went into the kitchen, and made some crepes. I was thinking about what I could do for the filling that would be easy, and that I wouldn’t have to run out to buy on a spur of the moment. I took some raspberry jam and happened to have some mascarpone cheese. Then I mixed everything up. Yummy. After I put the filling in, I folded the crepes up, topped it with some powdered sugar, shaved a lime for some zest and added some blueberries. What a great treat this was. 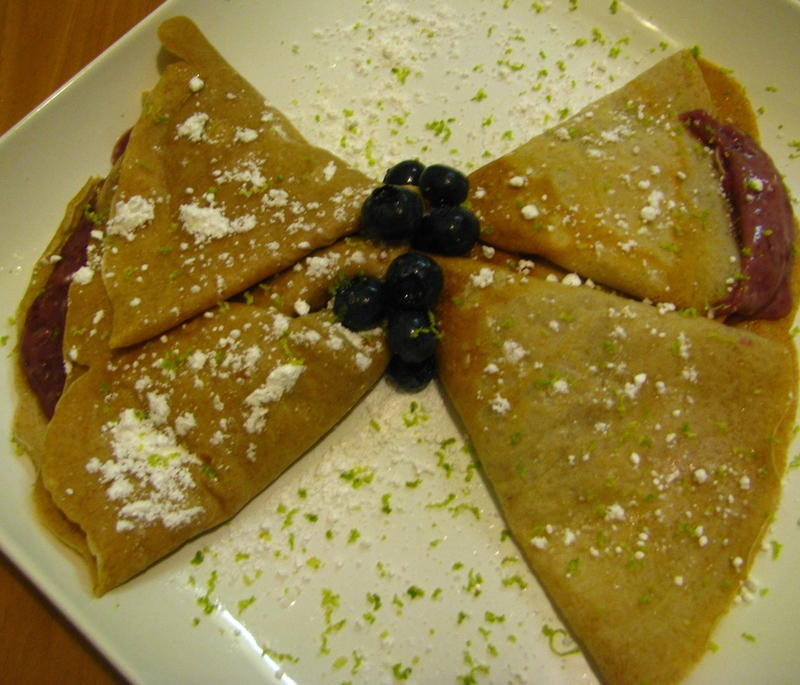 You can create any filling for crepes (sweet or salty). Go ahead, be creative and come up with something fun. All you need to make a crepe is egg, flour and milk. It ends up being a very thin pancake, and can be tricky to handle without tearing. It might take some practice, but see what you have in your cupboard and fridge, and try your own unique twist. I hope you enjoy. I have not made crepes in awhile. Your recipe sounds delicious! That is so easy. I can try this where I am. Great for the idea. My sweet tooth thanks you. I just want to say I am just beginner to blogging and site-building and definitely loved this page. Likely I’m going to bookmark your site . You absolutely come with fantastic posts. Kudos for sharing your website page.